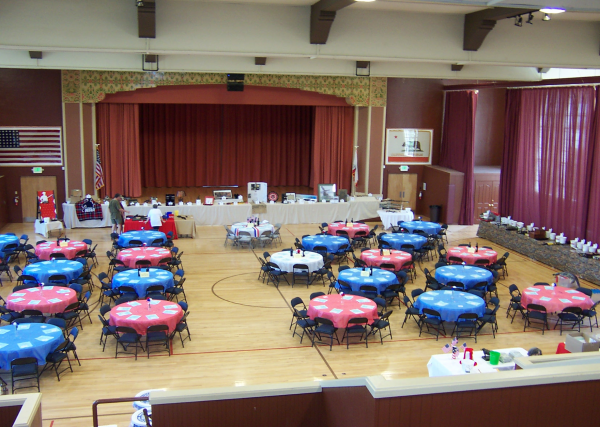 Grass Valley Veterans Memorial Building - Spacious historic hall with stage. Gorgeous hardwood floor. Capacity of 995, tables and chairs included. Plenty of parking. Walk distance to downtown. This venue is located within walking distance to downtown Grass Valley. Plenty of parking is available. The spacious historic hall and other meeting rooms are available year round for rental. The gorgeous hardwood floor is perfect for dining and dancing the night away. Draw the curtains and decorate for an elegant intimate event, or use all the floor space for casual event. The Grass Valley Veterans Memorial Building held its grand opening on April 23, 1932. The building was renovated in 2008 to provide modern comfort while preserving its historic character. This treasured venue is shared by the community for wedding receptions, fundraisers, dances, proms, meetings, dinners, musical concerts, theatrical productions, athletics, reunions and anniversaries. Several Veterans groups, including the American Legion, Disabled American Veterans, Marine Corps League and Vietnam Veterans, use the building for their meetings and special events. Come and enjoy the heart of the community! The Swiss House Restaurant, Grass Valley, California, offers traditional swiss quisine in the heart of gold country California.